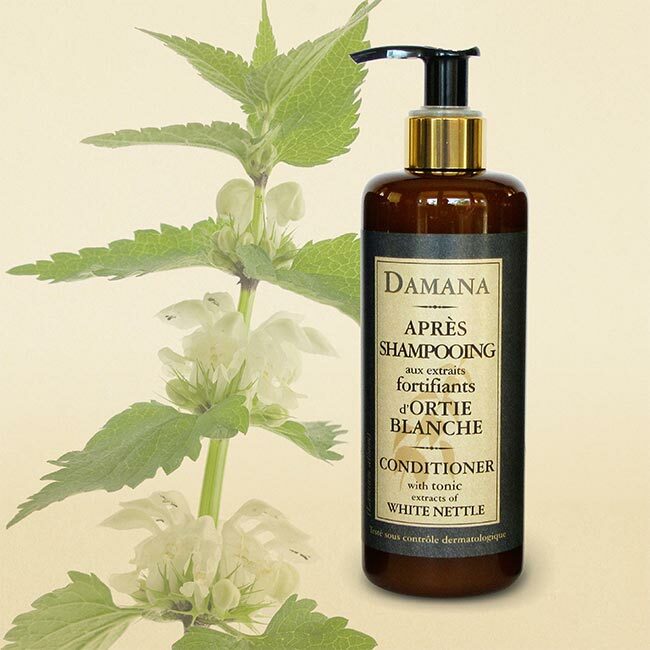 Conditioner enriched with extracts of white nettle by Damana made with Tonic extracts. It offers softness, hydration, shine and prevention of hair loss. Manufactured in France. White Nettle leaves help in a great way to get that flawless hair. Not only does stinging nettle help in combating hair loss, but it also helps in hair re-growth. Nettle leaves are rich in silica and sulfur. This helps in making hair shinier and healthier. Rinsing hair with nettle extracts and water results in re-growth of lost hair and also helps in restoring the original hair color. The benefits also extend into its ability to counter alopecia or hair loss. Many researches have given weight to nettle’s potential to stimulate hair growth and promote healthier, thicker hair strands. Conditioner enriched have properties which cleanse your body, blood, flushes out toxins and facilitate maintaining a clearer skin. 100% organic, natural, pure a super reasonable price, excellent balance to make your purchase. Instantly improve your hair using Conditioner with extracts of white nettle.